The High Atlas is a region in Morocco covering the mountain range and surrounding destinations such as Marrakech. It's a regular destination for mountain hikers, ski enthusiasts, or travellers interested in the indigenous Berber culture found throughout its many peaks and valleys. Berbers are the indigenous North Africans, having inhabited the north coast of Africa ranging from present day Morocco to Egypt, for at least 5,000 years. The Arab invasion of North Africa in the 7th century forced Berbers to assimilate, or take refuge in the Atlas mountains. It is said that as much as 80% of the Moroccan population is racially Berber, however only half of those people live culturally Berber lifestyles. Berbers have adopted Islam as their primary religion, but continue to speak dialectic Berber in their villages, and practice Berber music, spirituality, and art. 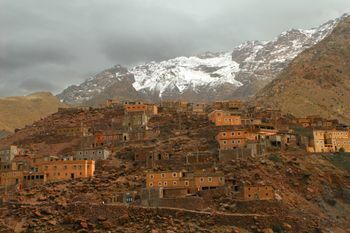 The Atlas mountains are home to relatively pure Berber populations, who live in earthen adobe houses. Marrakech is the only Moroccan city with a recognizable Berber ambiance, being situated at the base of the southern Atlas mountains. The color of Marrakech is the color of the Berbers - reddish, ochre and earth tones are the only colors you see adorning the adobe buildings, giving the impression that the entire city springs from the earth. Amizmiz – A small Berber town that hosts one of the largest Berber souks in the region. 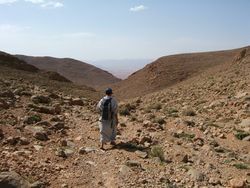 A great point of departure for the small Berber villages of the mountains. Imlil Starting point for some awesome hiking. Only 75 minutes from Marrakech by shared taxi. Tinerhir – This town is the perfect point of access to the stunning Todra Gorge. The stunning Ourika Valley - situated less than 30 minutes from the Marrakesh Medina - is a portal to the High Atlas, and home to many Berber villages. Ait Bouguemez Valley: possibly the most beautiful valley in the high Atlas range. Situated in the heart of the central part of the High atlas where villages, stunning mountain views and traditional Berber communities have reigned for centuries. An exclusive lieu to visit , to trek and to drive through ensuring an amazing experience either in groups, families or alone. If you are looking to experience how real Berbers live in the High Atlas, there are different outfits that will help you get to some of their villages. You can visit the Ecomuseum "Vallée des Bougmez", which is a cultural and authentic place. Visitors are immersed in the yesterday and today daily life of the Ait Bougmez region. This Ecomuseum is located in Zaywat Oulmzi, a secular village at the end of the valley. This page was last edited on 23 December 2018, at 07:42.